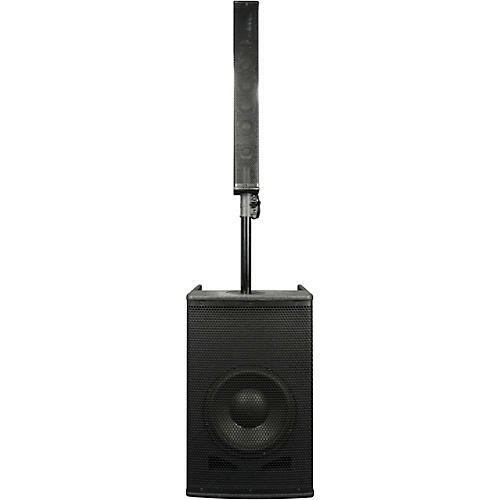 This powerful 2-way PA system combines a 10 in. bass module with an adjustable, pole-mounted array of six 2 in. drivers to deliver room-filling sound with outstanding dispersion. With onboard amplifiers cranking out 750W RMS (1,500W peak) Class D power, the setup generates dynamic high- and low-frequency sounds. A fully-featured 6-channel mixer is also integrated into the STK-106W’s sub enclosure, meaning that multiple microphones and audio sources can be connected and mixed with dedicated controls. This makes the system perfect for solo singers and duos who can hook up mics, instruments and backing tracks without the need for an external mixer. The mixer section features two mono input channels, which each have combination XLR / ¼ in. jack input sockets that can be switched between Mic and Line level. In addition, there are two stereo input channels, one offering a choice of ¼ in. jack and RCA inputs and the other fitted with a mini-stereo input jack for direct connection of an MP3 player. Each channel has a dedicated level control, while the two mono channels also feature independent Bass, Treble and Reverb controls. A separate master Volume control has been included, alongside an internal Limiter which protects the system from excessive input signals. There is also a separate Monitor output connection, with a dedicated level control, provided via a stereo pair of RCA sockets. This can be connected to a performer’s powered floor wedge or In Ear Monitoring system. In addition to conventional wired connections, the STK-106W is also compatible with digital wireless audio streaming. It can easily be paired with a computer, tablet or smartphone for direct audio playback without the need for a connecting cable. Not only that, two systems can also be wirelessly paired to create a cable-free stereo link. With a solid plywood housing and discrete textured black finish, the STK-106W is designed for a life on the road. Its base unit is fitted with two convenient carrying handles and, with a total weight of just 45.2 lb., it is easy to carry and transport. It also features a recessed back section in which the satellite and mounting pole can be securely stored during transit, while the included padded transport cover will help to protect the whole system from scratches and scrapes while it is being moved between events. Designed with ease of use in mind, the STK-106W is extremely simple to setup. The adjustable pole mount fits securely into the top of the sub and then the satellite simply slides on top. Power is provided via an IEC input on the back panel of the sub enclosure, while the satellite is connected using a standard locking SpeakCON cable. Offering excellent mid-range coverage, the STK-106W is ideal for live vocal performances as well as for speech amplification. Meanwhile, rich deep bass reproduction and clear high frequencies also make the system perfect for use by mobile DJs and entertainers playing pre-recorded music. With an unbeatable combination of audio quality, flexibility, portability and affordability, the STK-106W really is the ultimate portable array speaker system. If you need a powerful, versatile and easily transportable speaker system for live performances or DJ sets, the STK-106W offers outstanding performance and value. HF driver:	6 x 2 in. A. American AudioÂ® hereby warrants, to the original purchaser, American AudioÂ® products to be free of manufacturing defects in material and workmanship for a period of 1 Year (365 days) from the date of purchase. This warranty shall be valid only if the product is purchased within the United States of America, including possessions and territories. It is the owner's responsibility to establish the date and place of purchase by acceptable evidence, at the time service is sought. Products identified as a "Blem" or "Refurb" carry a 90-day warranty and are otherwise subject to the terms and conditions stated above. B. For warranty service, send the product only to the American AudioÂ® factory. All shipping charges must be prepaid. If the requested repairs or service (including parts replacement) are within the terms of this warranty, American AudioÂ® will pay return shipping charges only to a designated point within the United States. If the entire instrument is sent, it must be shipped in its original package. No accessories should be shipped with the product. If any accessories are shipped with the product, American AudioÂ® shall have no liability whatsoever for loss of or damage to any such accessories, nor for the safe return thereof. C. This warranty is void if the serial number has been altered or removed; if the product is modified in any manner which American AudioÂ® concludes, after inspection, affects the reliability of the product; if the product has been repaired or serviced by anyone other than the American AudioÂ® factory unless prior written authorization was issued to purchaser by American AudioÂ®; if the product is damaged because not properly maintained as set forth in the instruction manual. D. This is not a service contract, and this warranty does not include maintenance, cleaning or periodic checkup. During the period specified above, American AudioÂ® will replace defective parts at its expense, and will absorb all expenses for warranty service and repair labor by reason of defects in material or workmanship. The sole responsibility of American AudioÂ® under this warranty shall be limited to the repair of the product, or replacement thereof, including parts, at the sole discretion of American AudioÂ®. All products covered by this warranty were manufactured after January 1, 1990, and bear identifying marks to that effect. E. American AudioÂ® reserves the right to make changes in design and/or improvements upon its products without any obligation to include these changes in any products theretofore manufactured. F. No warranty, whether expressed or implied, is given or made with respect to any accessory supplied with products described above. Except to the extent prohibited by applicable law, all implied warranties made by American AudioÂ® in connection with this product, including warranties of merchantability or fitness, are limited in duration to the warranty period set forth above. And no warranties, whether expressed or implied, including warranties of merchantability or fitness, shall apply to this product after said period has expired. The consumer's and or Dealer's sole remedy shall be such repair or replacement as is expressly provided above; and under no circumstances shall American AudioÂ® be liable for any loss or damage, direct or consequential, arising out of the use of, or inability to use, this product. G. This warranty is the only written warranty applicable to American AudioÂ® Products and supersedes all prior warranties and written descriptions of warranty terms and conditions heretofore published.